Have you ever purchased something and received the wrong quantity or the wrong size because you assumed the wrong unit of measure? Oh man, that has got to be very unfortunate for Biff. Come with me…or…or you’ll be late. As in the late Dentarthurdent. It’s sort of a THREAT, you see? Can’t say I have, no. Chris, you have now doomed us all! Well Michael, that seems like it would have been as good a time as any to take up stilts. You’d think someone at the factory would have realized that no one needs pants with an 87 inch inseam. I ordered a three-cup French Press a while back. Apparently Bodum uses a vastly smaller size of “cup” than everyone else, since it makes three espresso-cups-worth of coffee, which ALMOST fills a single coffee cup. He’ll be fine, until a slight breeze happens. Why do you need to type THREAT in caps? Reminds me of the coward’s guidebook on intimidation. @Solstice Zero – No, this is the correct way around. Biff requested the ambient temperature of the planet be 100 degrees (thinking they asked for Fahrenheit). He got a planet that is 100 degrees Celsius. But I was actually wanting to sort out the confusion about all the asking. I fear I might go on at great length if I were to continue by explaining the extent to which I have misunderstood so far. But I must say something. I believe I must be native to Kakrafoon after the enloudenment, you see. I must continue to generate distracting matters of complication, lest I leave anyone else of my kind to sense how truly full of myself I am. It is also reasonable to suspect that some part of my physical anatomy might, in a selfess effort to save this world of Biff, become sentient enough to catch on to what the guiding sentience of my being is up to, and conclude that it’s only recourse is to reach up and throttle my brain back into oblivion. And so I, myself, believe I must escape this window forthwith. And in believing, so I do. I initially thought there was a mix-up too. Biff realized his mistake as he stepped off the ship into a planet with an environment at a nice toasty 100 degrees Celsius, like the Builders were asking for. Meanwhile… how will it end this week? Phenomenology? …or are we still moving on? I was almost confused at first, thinking Biff was delivering temperature to the planet. Then I realized that he was ordering from the Planet Builders. I LOVE HITCHHIKERS GUIDE. That series is my bible. I don’t know if this counts, but I placed an order through my school for 20 notebooks and they sent me 50 packs of paperclips instead. Stupid notebook-to-paperclip conversion scale. They crash-landed a Boeing 767-200 in Gimli, MB because of that. They had just switched to the metric system and because of a conversion error, the plane took off with less than half the fuel it needed to get from Montreal to Edmonton. It ran out of fuel over Red Lake, ON and glided (yes, GLIDED) to Gimli, where it landed on an old abandoned military runway. On top of that, the landing gear didn’t open. You can still see the skidmarks on the runway. No one was hurt. @kaitou, Egads man! You’ve found the error of the human race. We’re supposed to have 13 fingers, not ten! I never got anything mixed up like that in a long time. Besides, the only thing that happened that is remotely similar was I received something in the mail that didn’t fit my lifestyle. I bought some CDs from a German record company and they sent me the discs I want…along with an empty refillable lighter. That’s what Biff gets for stealing my rocket!!! If anyone thinks I use this name because I couldn’t come up with anything good your wrong! This is an awesome name!!! Maybe he asked for 303 degrees. That would really burn. Let’s not forget about Kelvin. 303 degrees Kelvin is 30 degrees Celcius, if I’m not mistaken. Hah, I immediately assumed Biff ordered in Kelvin, shows what a science geek I must be. If he wanted Kelvin but got Celsius, then stuff really would be burning! I would have counted, but me no Vogon. So… Odd, considering that I knew today was Friday, having just returned from my working Thursday night, but when I looked forward this morning to how this week will end, I had thought there would be one more left, because I had only joined in Thursday, thanks to fellow traveler’s heads up on the ZZ9 Yahoo! group, and I miss-counted back, thinking that Dent had started us off. Now what? @ kaitou: but why base thirteen? Not even Old Twelve Toe, from the Schoolhouse Rock series would count by such odd numbers. If nothing else is certain to be seen out there… The balance must remain. Buying stuff for dressmaking is a pain. All clothing sizes are worked out from inch measurements, but fabric is sold by the metre, not by the foot. Clothing sizes in other countries are easy to work out, because most sites have a sizing chart – but shoe sizes are the biggest pain. Trying to go from Australian to European shoe sizing is a nightmare. ZackDark- Or, this is the Webcomics Sector of the internet, which means we’re all pretty nerdy. In case anyone hasn’t mentioned it, the first letters of the comic titles for this week form a word! I’m stuck between feet and meters. I can’t even remember how most of the measurements of the system the US uses work…. The sooner we switch to the metric system the sooner I’ll probably be able to figure this out. Chris! You had exactly 42 comments, but you posted and messed it up. Well, now he has 45 comments. I don’t really see the difference. Am I missing something here? Maybe the last few comments could be deleted? @ Chris: Has it ever been mentioned just what these points are good for? I’d wager that this week’s were only exchangable for ningis. I’d guess they were good for pobble beads as well, but I don’t know enough about them. It is quite likely those are actually poratble assets, albeit assets which only exchangable for equally non-convertible ones. I had a dream about a living toaster last night. @steve-o: what do you mean “Am I missing something here?” have you never read THHTTG? Get some sense of proportion. @Steve-o: 42 is the answer to life, the universe, and EVERYTHING. But what is the question? As punnishment, you must wait seven million years into your next life to read book six of three. PS: Don’t Panic. Given the extraordinary confusion and miscalculation of scale awash about the universe, this may prove to measure a distance of time more or less equivalent to a number of small dogyears. Or perhaps it’s only just a suffusion of yellow. And you’ll nehuheeeevuherrrr wallllkk ah-uhlone. You’ll nehver waalk ahuhlooooooooooooone. Well…. thats the last time Biff ever asks for the planet temperature to be 70 or 80, thinking it twould be Farenheit. And… for that matter plants love heat, as their photosynthetic processes are optimalized at the balmy temperature of 40 to 50. Centigrade folks. Thats Centigrade. 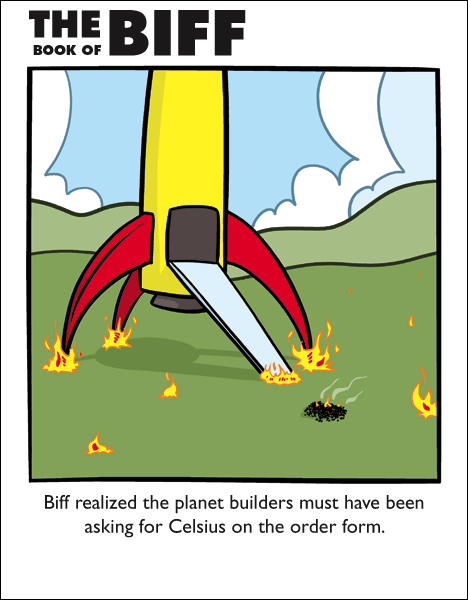 Knowing Biff from this comic he must be like someone i know and would have ordered the planet at well over 100 degrees Fahrenheit. Unless Centigrade does not equal Celsius I believe that is wrong. According to my Grade 12 Biology class C3 plants photosyntheses optamises at abour 20C, however a reverse process called photo respiration optimizes at about 40C. At some point the photosyntheses starts to go BACKWARDS! C4 plants (and another type that i don’t remember avoid photorespiration and as a result thrive at higher temperatures. DUH, “slartibartfarst” the name of the planet builderfroh hitchhiker’s guide! The Imperial system is just so much more interesting. I wasn’t going to comment, though I like this one, until I saw that the title of the comic is “Slartibartfast” and it made me so happy that I had to thank you. So thanks! It’s awesome that you used that. I just started reading the comics again. I’ve been looking through the ones i’ve missed and it seems… I MISSED HITCHHIKER’S GUIDE TO THE GALAXY WEEK!! noooo!! !